Below is another story sent in by a reader about Rescued GSD Ranger and her own experience with rescuing a German Shepherd. I hope you all enjoy reading it. 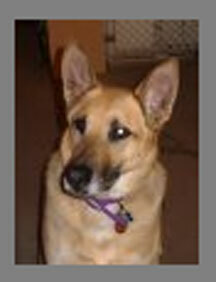 I first met my soon to be 1st GSD Ranger @ the Santa Fe Humane Society on 12/99. I took 2 of my kids to the shelter to play with the dogs & cats as we always did, the kids went to play with the cats & I went to the kennels to get a dog to walk. I opened the door to the kennels & in the 1st run was the goofiest looking german shepherd I'd ever seen, he was about 10 months old & his ears were bigger than his body. When our eyes met it was LOVE @ 1st sight, I just knew I had to have him. I called my husband & told him to get up there, in the mean time I filled out the paperwork so no one else could get him. My husband saw him & liked him but said we couldn't afford to get him & didn't have the room, I was broken hearted. The next day when Scott came to pick me up from work he had the dog with him, what a surprise. We sat down that night with a list of dog names & started calling them out to him, when I said Ranger he came to me, therefore he came by his name Recon Ranger. Wherever I went he was with me, he was my protector, my companion, my very best friend. Sadly Ranger passed away 2/28/09, my heart broke that day but @ least we had 9 1/2 wonderful years together. For my anniversary/birthday my husband got me a 6wk old GSD pup (which I named Zena) as I was having such a hard time coping the loss my precious Ranger.